This beautiful woven snood is the perfect way to keep your hair looking tidy for the whole day while complimenting your favourite Medieval or Renaissance gown. This snood is a woven hairnet that will adjust itself to hold any amount of hair from quite short to medium length. 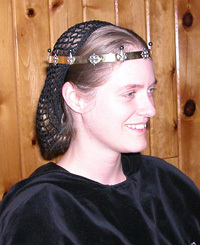 Hairnets were worn by many classes of women for much of the High Middle Ages and Renaissance and authentic examples are on display on the Museum of London and the British Museum. This machine woven snood is made from top quality acrylic fibres for long wear and is elasticized to fit most heads. While more robust than medieval examples, this quality snood will give long wear while approximating an authentic medieval look. Either worn under a veil or on its own, this snood will cover even the most modern of hairstyles and give an air of authenticity and class to even your finest garb. A perfect finishing touch! Available in purple, black, green, blue, white or red. 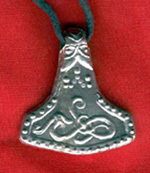 Classic six-stone style typical of High Gothic silverwork. 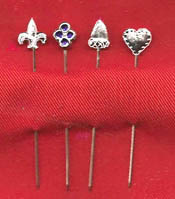 Pewter with a steel pin. Available in blue, red and green. This is a reproduction of an original cast pewter ear spoon and nail scraper from the late 1400's. The original had a bent and damaged nail scraper, which has been corrected in the reproduction to conform with other sickle-shaped scrapers from this time. Cosmetic implements such as these were popular for many centuries and have been found in a variety of materials from Roman times through to the late Renaissance. Reproduction. These pewter hangers were attached to belts and used to suspend purses, knives, keys and other personal items. They also protected valuable decorative belts from being distorted by hanging cords. 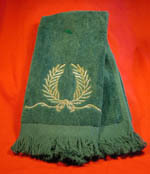 Mop the brow of your favourite Peer with this plush terry cloth hand towel, embroidered in gold with a Laurel wreath. 18 x 12 inches. Available in Aqua, Burgundy, Forest Green (shown), Dark Blue, Sky Blue, Rose and White. 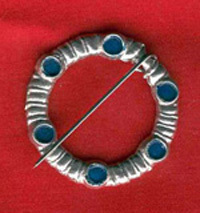 Based on a Saxon carving, this brooch is a tribute to the art of the 9th century. Based on period examples, these two-part badges can be custom ordered with your barony, household or personal arms. * And a Pricipality too! Click on any of the Kingdoms to see the arms. 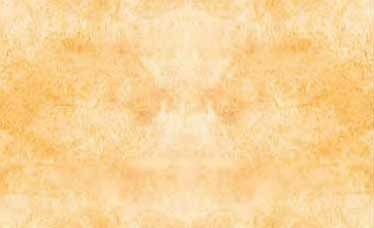 This image is not yet available. This heraldic lion holds a feather in the cylinder behind him. 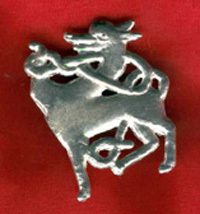 Such badges were commonly used to ornament hats, and examples can be found both as religious and secular pieces. Based on a livery badge. Reproduction. 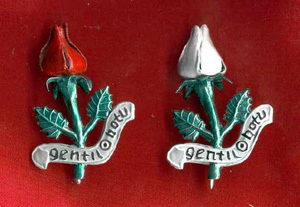 This complex badge depicts a three-dimensional rose blossom with the motto "Gentil Botu". Crafted in pewter, this rose bud will never wither and is a symbol of enduring devotion. Available in white and red. If you buy one charm hanger, regularly priced at $5, (fleur de lis or compass) and one of any of the charms, this combination is only $8. Reproduction. 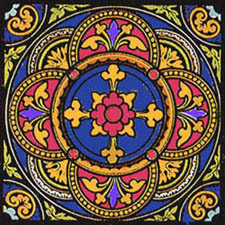 Fleur de Lis or Compass Star styles. These round badges were made in a variety of styles, and were used to suspend pewter badges and pilgrim tokens. 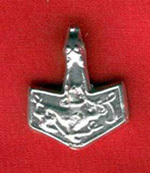 This is the sign of the great Norse god Thor, who with his mighty hammer fought many battles against evil giants and monsters. He was said to ride his chariot across the sky causing thunder and lightening.